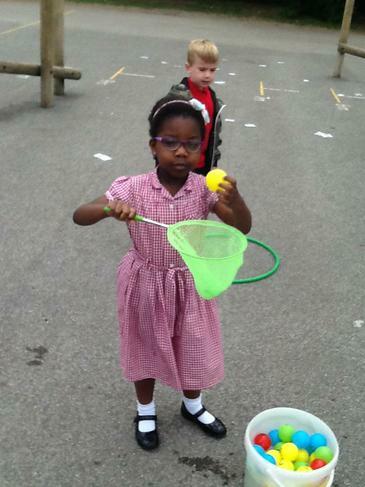 This week we found an empty fish tank the classroom. 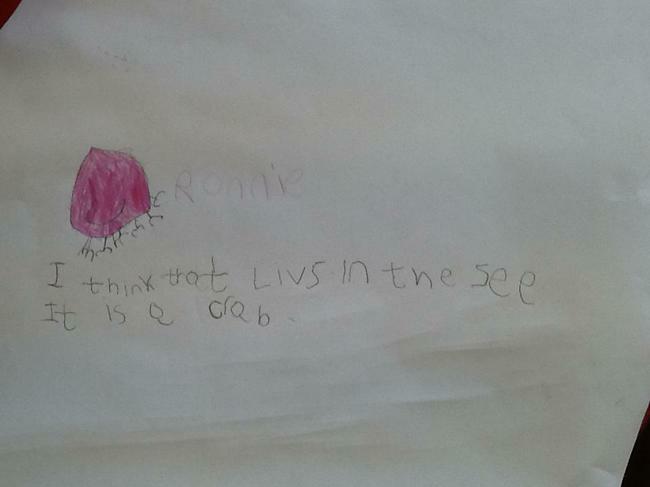 Inside it contained a story book and some coral. 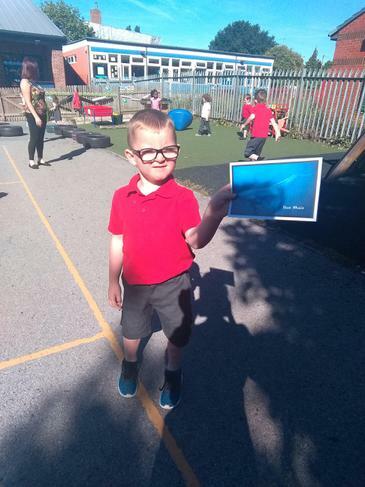 We were unsure who the tank belonged too but we soon guessed where our next learning adventure might take us…UNDER THE SEA! 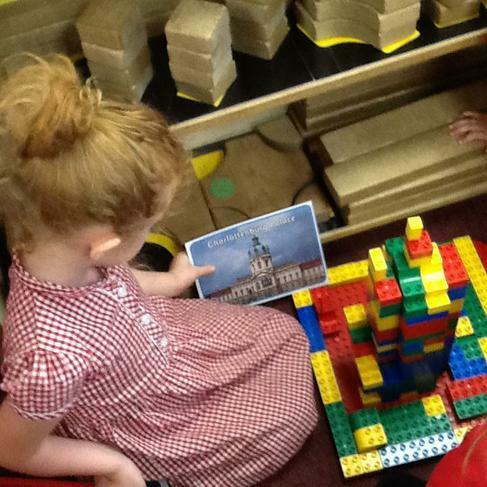 To start our new adventure the children have been thinking about what they already know this week. 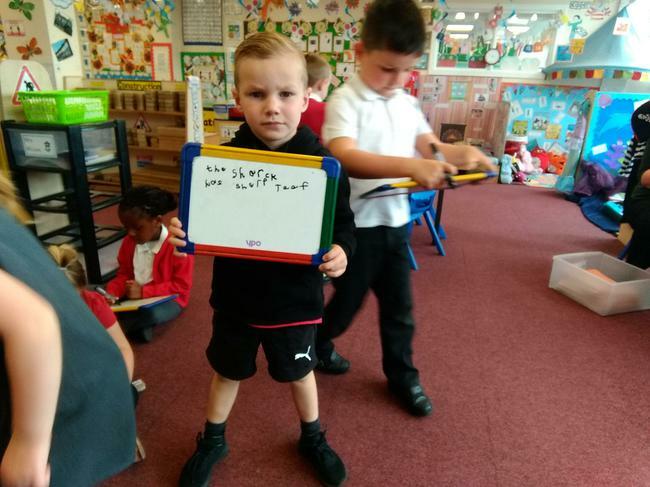 On Monday the children shared their knowledge with each other and created a large mind map of what the things that they already knew. 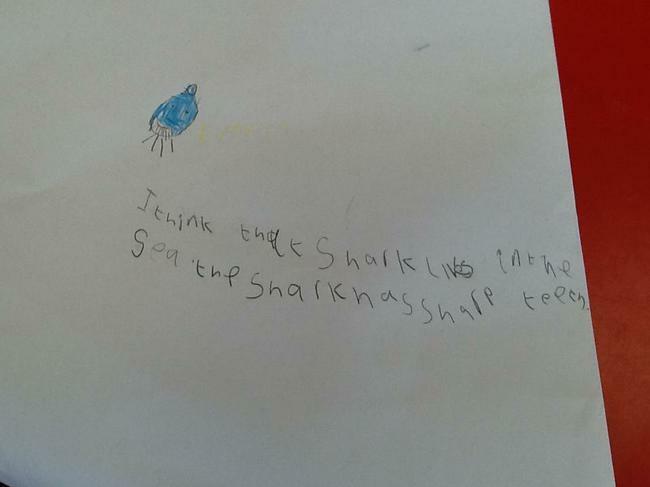 The children even mentioned ‘swordfish’ and the ‘Pacific Ocean’. 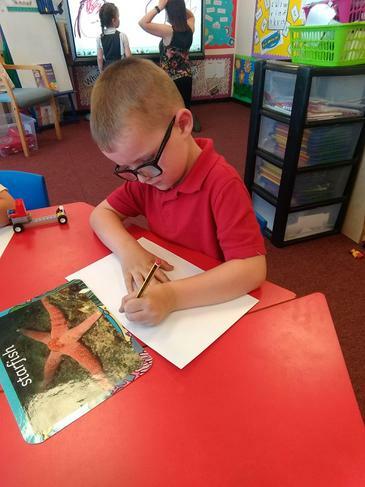 The children have also worked together to create their own large under the sea picture where they have drawn and written about various sea creatures. 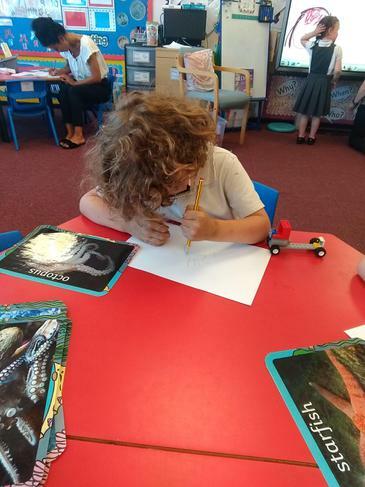 The children have also carried out an independent piece of writing about what they think lives under the sea when playing in the sea-life role play area. 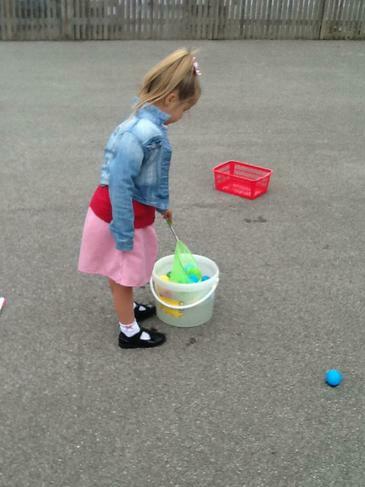 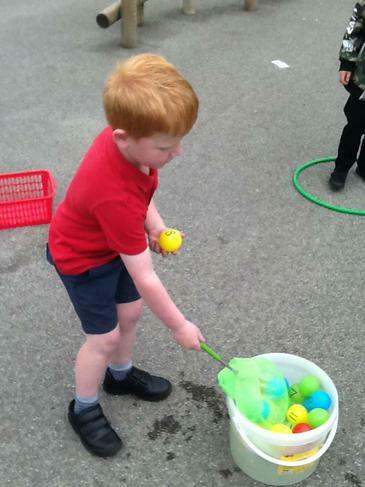 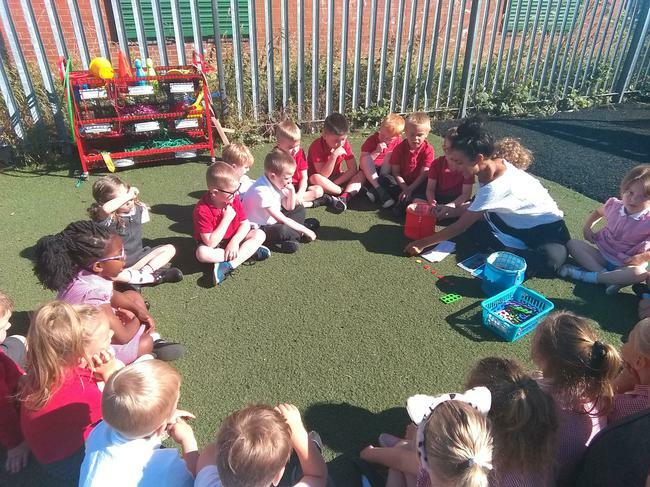 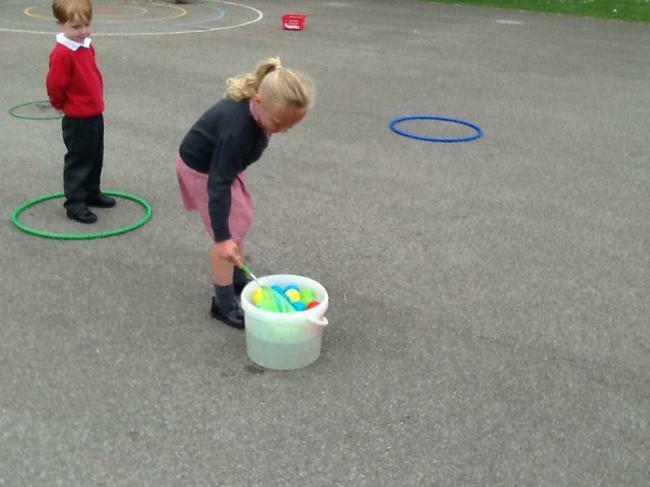 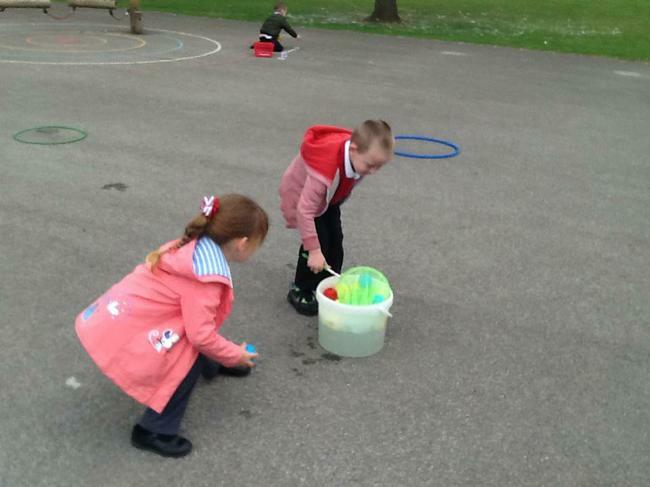 Other activities this week included making our own fish tanks and carrying out a floating and sinking experiment. 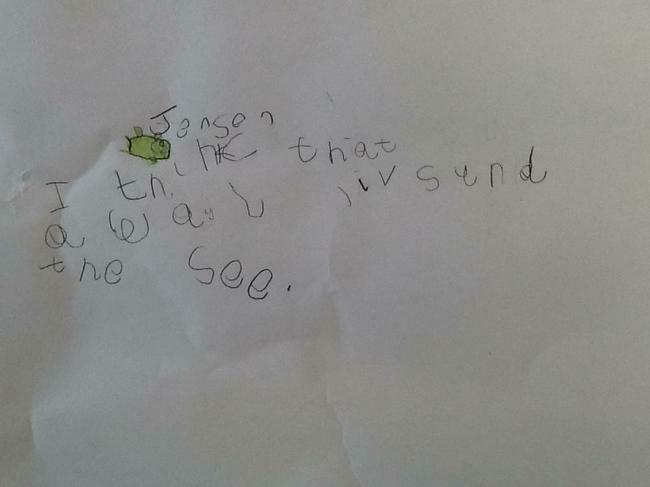 Later on in the week, we found out that the fish tank belonged to Tiddler. 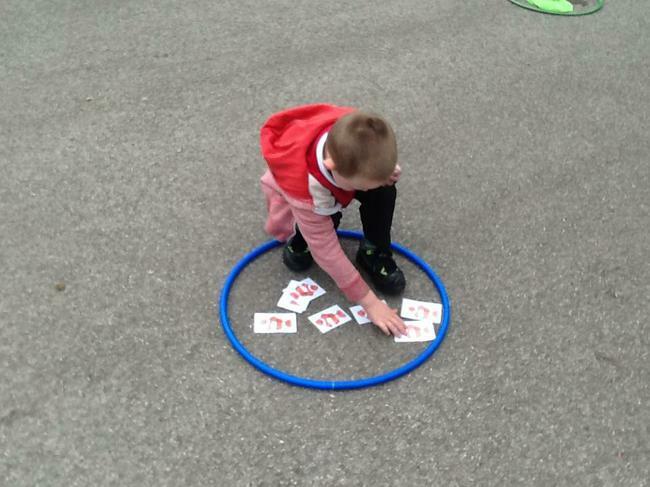 We learnt that we are going to be following Tiddler and his tall tales throughout the half term. 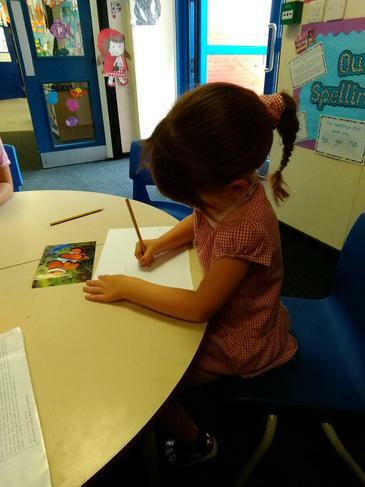 On Monday morning we came into the classroom to find a letter left by Tiddler. 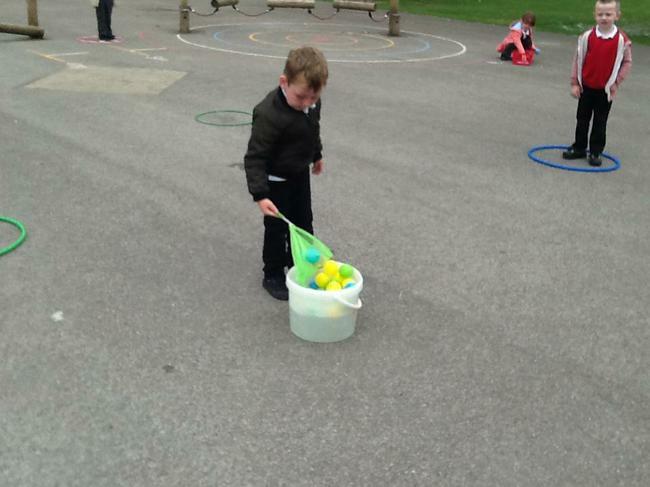 He was feeling sad as he has met some new friends on the way to his grandmas house and he didn't know anything about them. 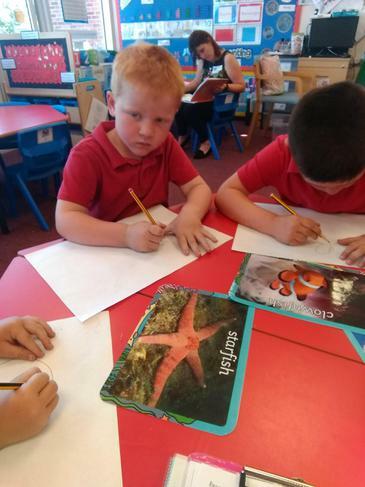 This week we have focused our learning around particular sea creatures. 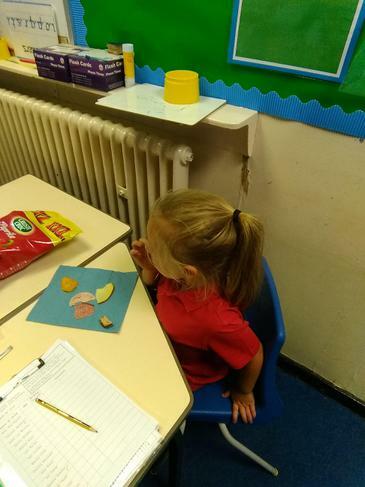 We have learnt lots about crabs, fish, sea horses and sea turtles by looking at Power Points and by researching on the internet. 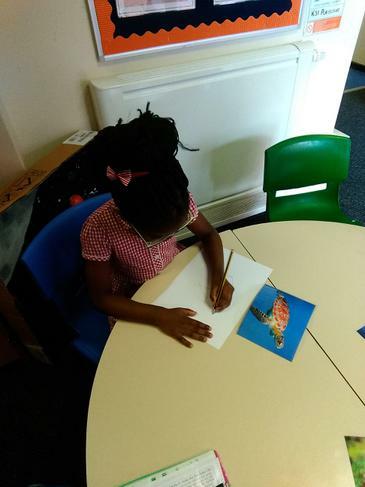 The children have used the knowledge they have learnt to create group fact sheets on various animals and they have also all created their own sea creature fact file booklet. 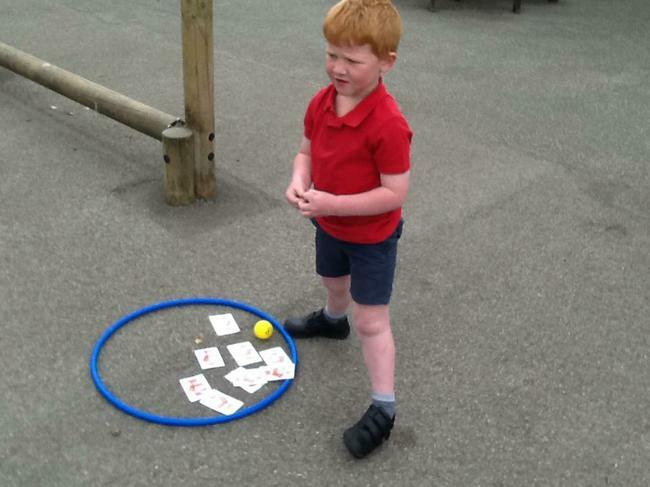 We then passed on all of this information to Tiddler so that he felt happier about his new friends. 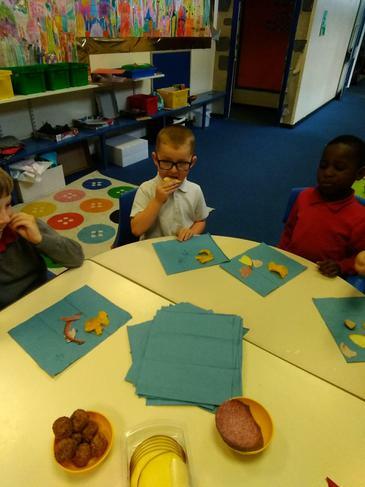 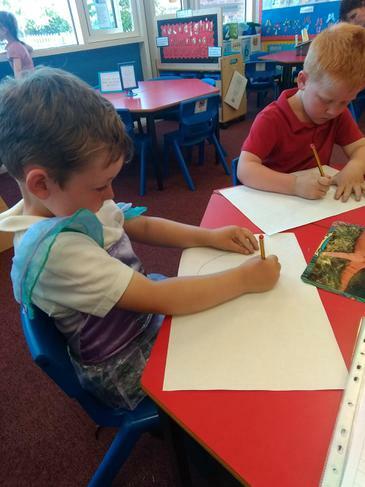 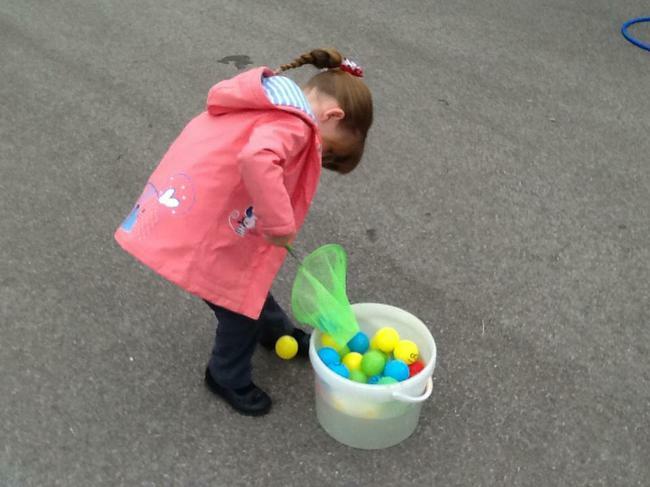 Other activities that the children have done this week include; collaging a fish using various materials, doubling the amount of fish in the fish tanks, painting their own sea creatures, creating their own fish tanks full of fish and making beautiful father’s day cards. 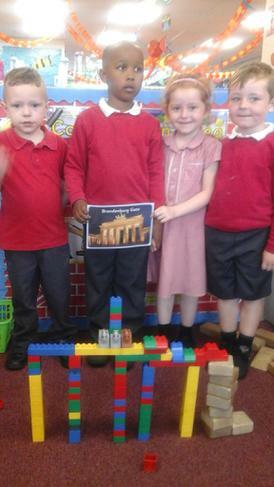 What a super week Reception, well done!! 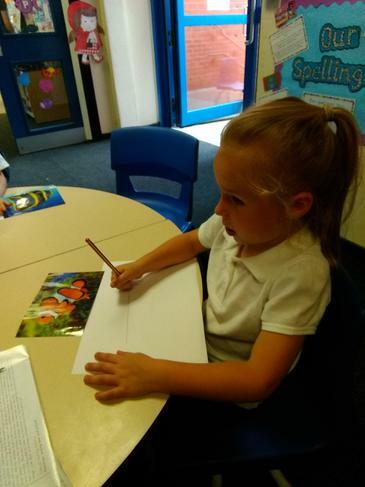 This week the children have learnt lots about sharks and whales. 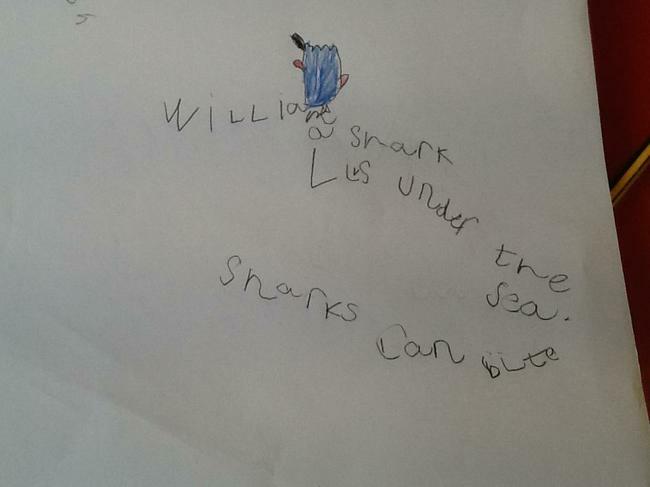 On Monday, we recieved a phone call from Tiddler telling us that he had seen a shark attack. 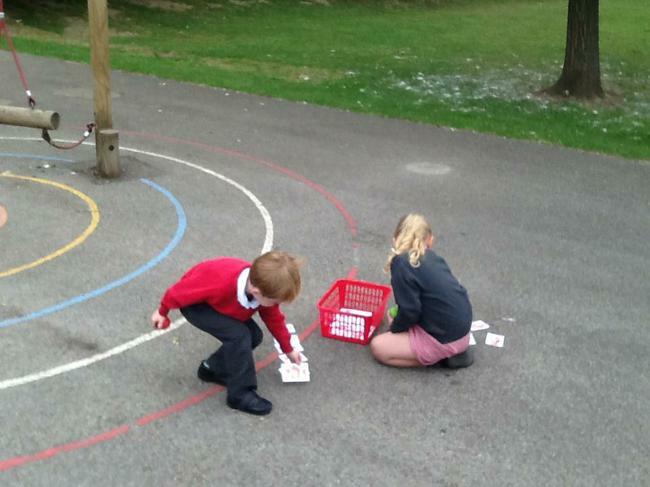 He sent us on a mammal hunt around school and we learnt lots of new facts abut marine animals. 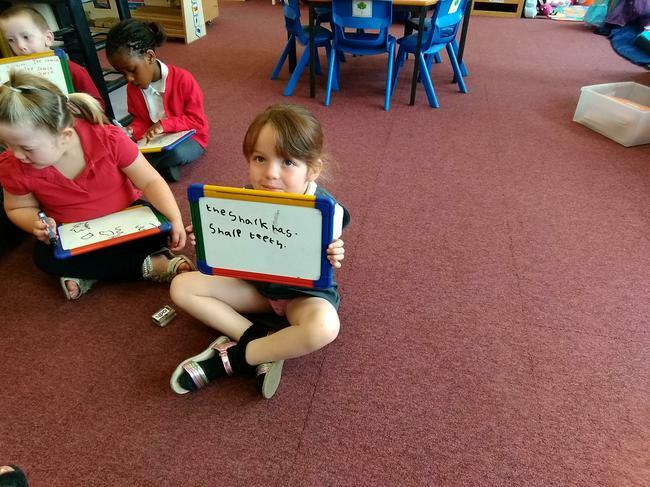 The children wrote down some of what they had learnt and they thought of lots of describing words when writing about sharks. 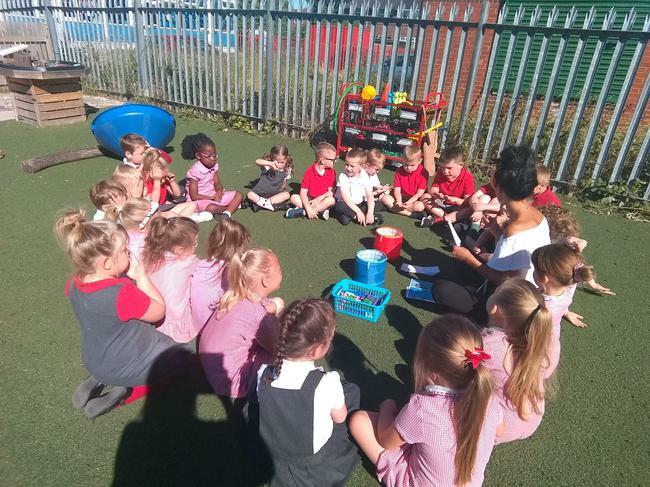 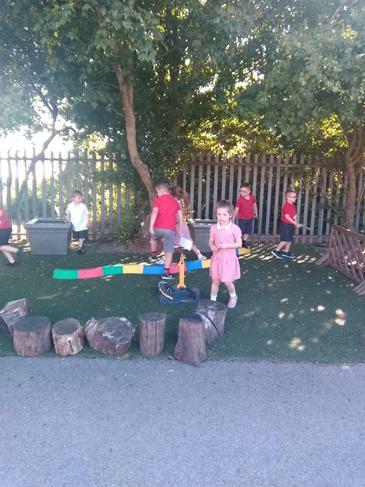 The children couldn’t believe how big some sharks and whales are and they really enjoyed using the metre stick when comparing both animals measurements when outside on the field. 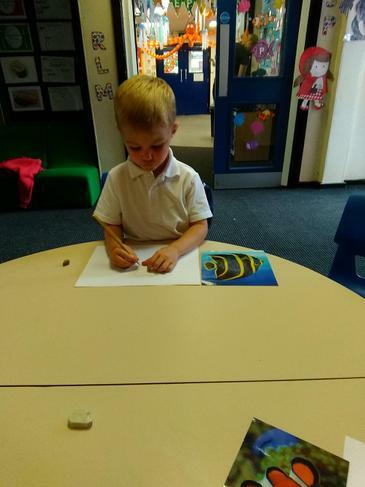 The children have also done some super work with Beebots and have finished off their sea creature paintings. 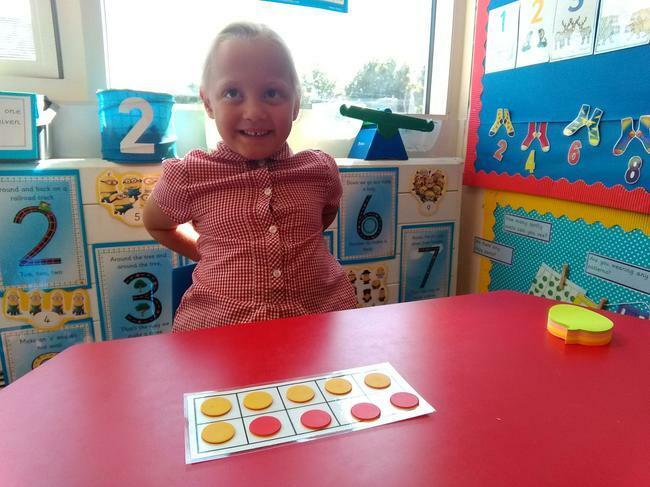 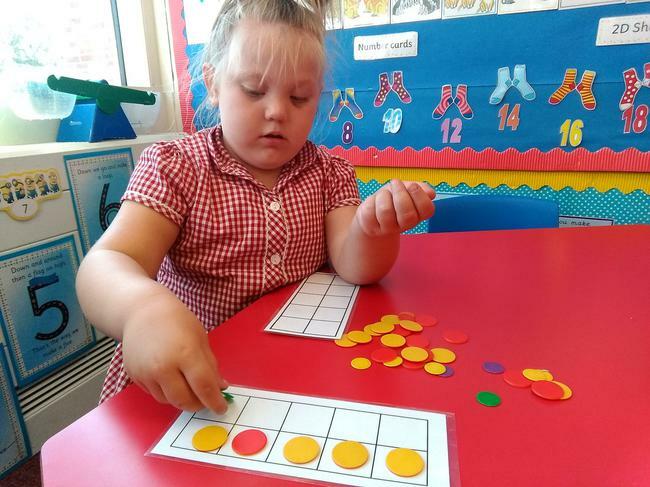 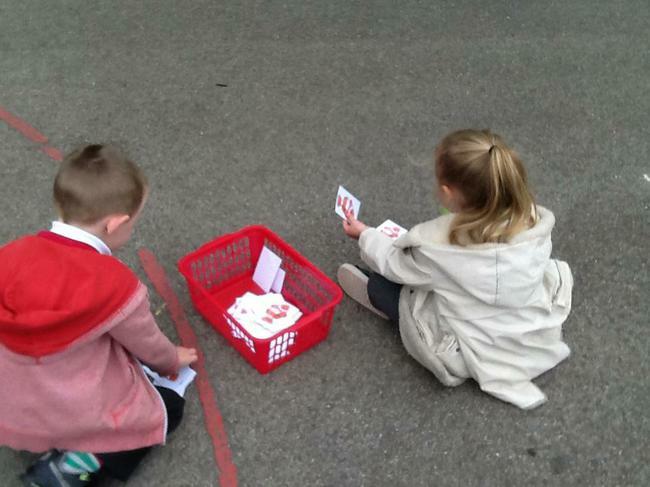 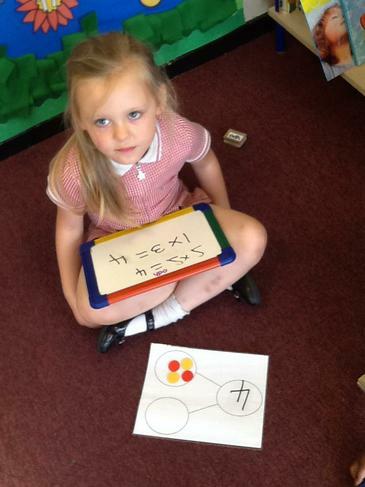 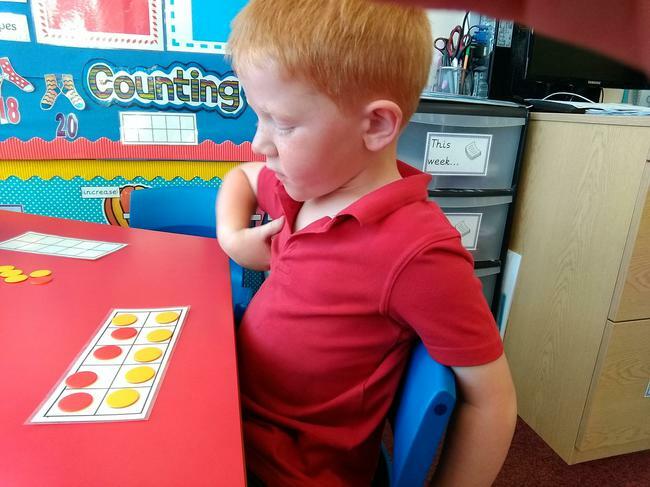 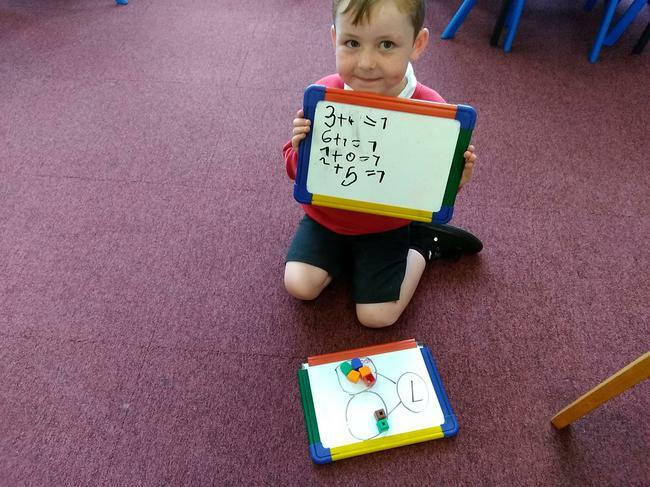 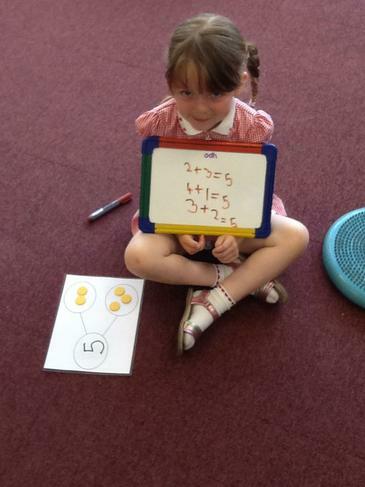 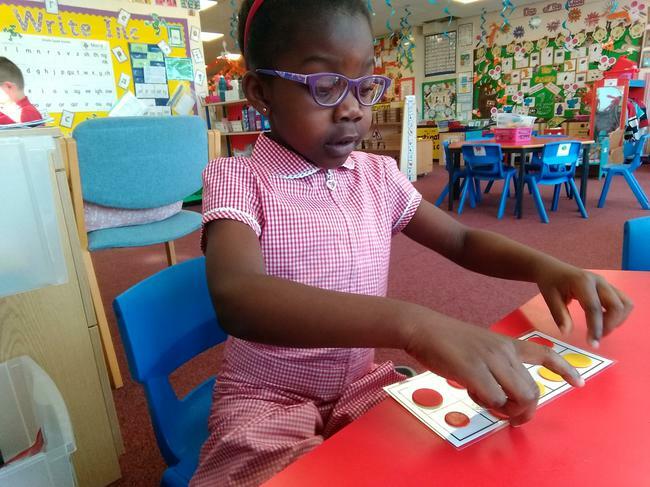 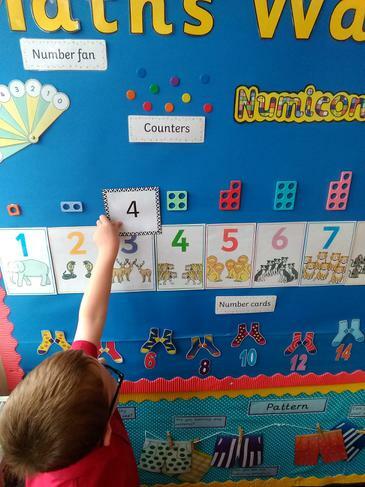 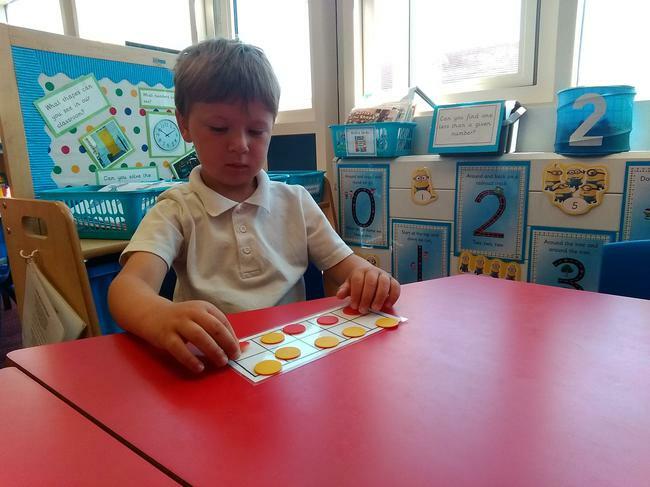 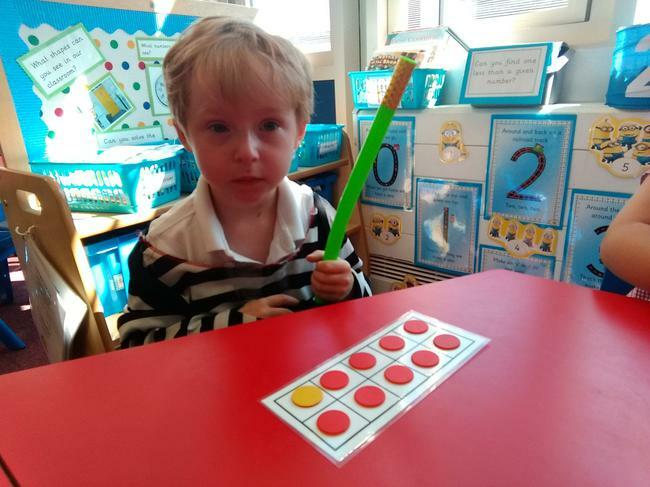 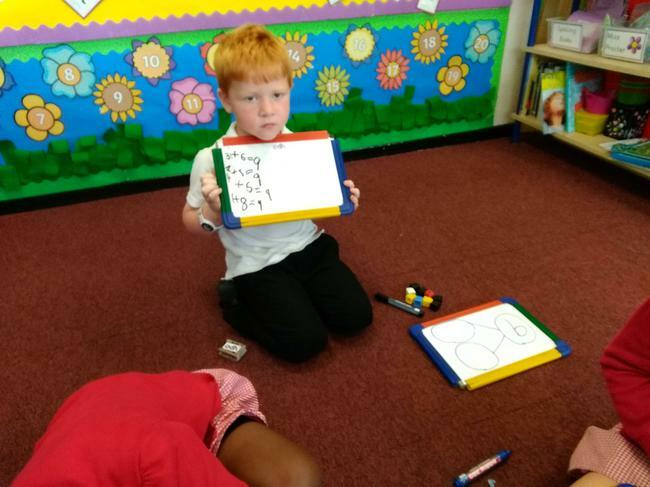 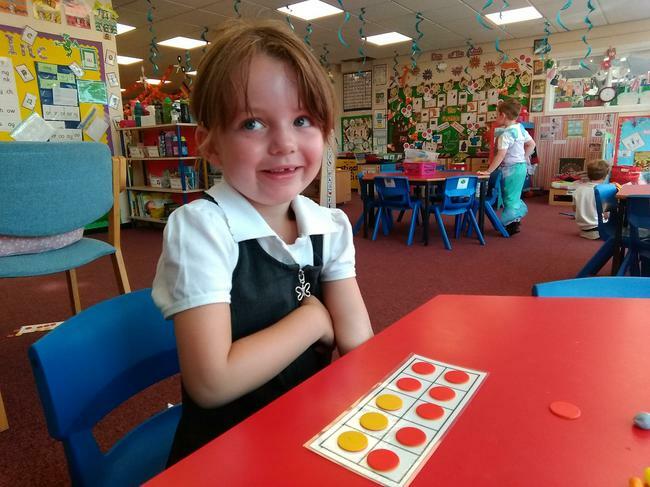 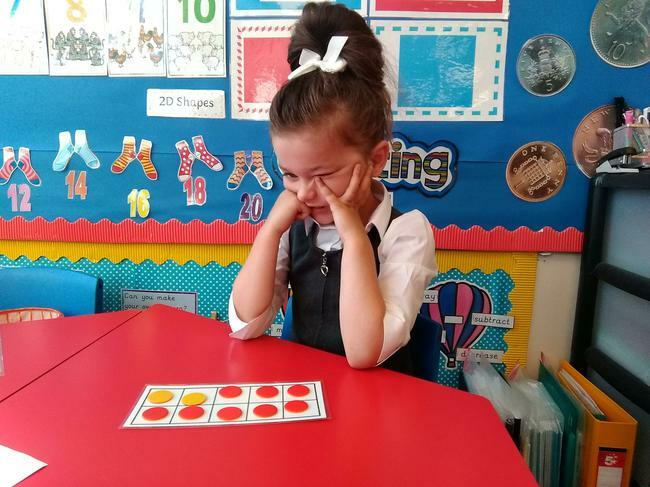 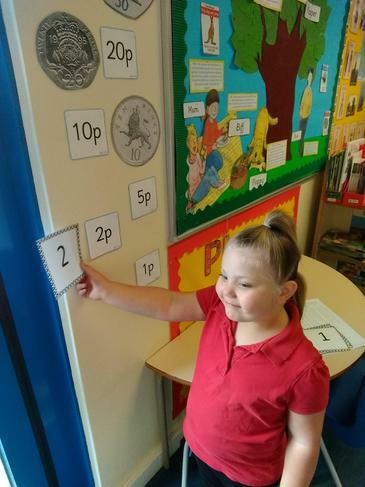 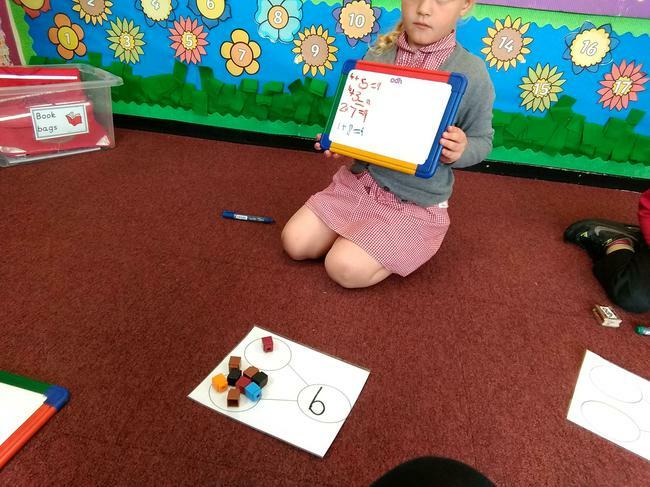 In maths this week, the children have been making ten in different ways using a ten frame. 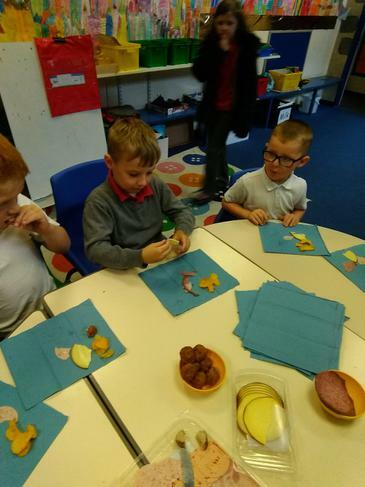 Other activities that the children have completed this week include; painting sea creatures, making a paper chain octopus and decorating their own fish stick puppet. 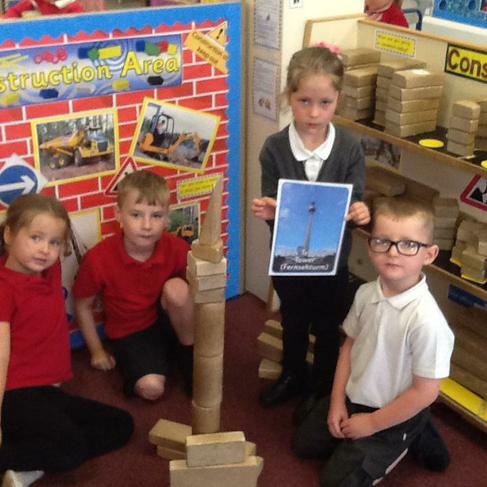 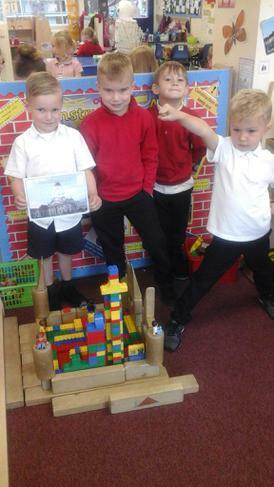 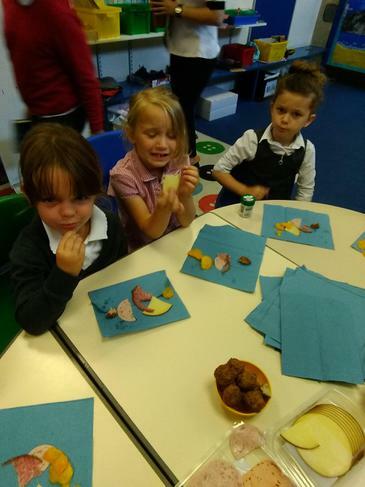 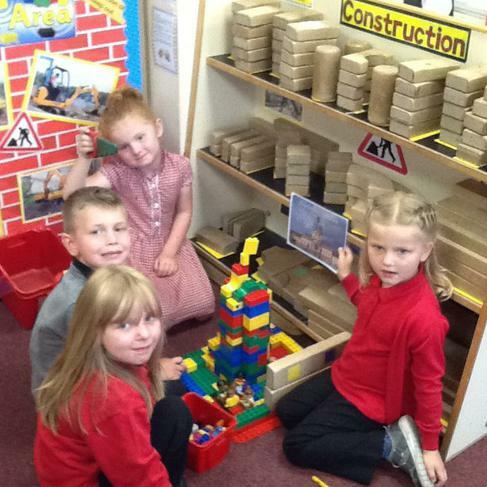 Fantastic work Reception, well done!